Classic, low-profile design provides the capacity of a 1 liter ultralight boiler in the easy-to-pour profile of a tea kettle for boiling water or melting snow oover camfires or coals. Convenient folding handle locks into place when boiling to save your finger tips from burns. Classic, low-profile design provides the capacity of a 1 liter ultralight boiler in the easy-to-pour profile of a tea kettle for boiling water or melting snow oover camfires or coals. Convenient folding handle locks into place when boiling to save your finger tips from burns. Unique bowl + mug solution with low center of gravity and Sip-It lid virtually eliminate spills while the insulating sleeve keeps your drinks hot. Stuff sack&apos;s nylon bottom panel and short sides help to keep soot and char off your clothes and other gear. 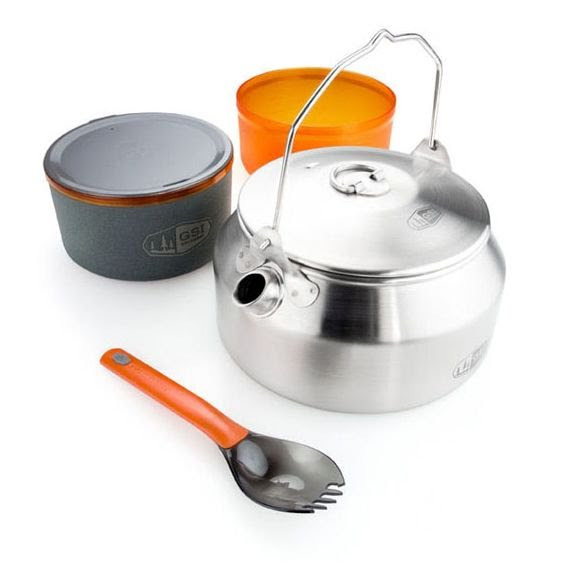 When it comes to durable, lightweight kitchenware, thousands of Boy Scouts can&apos;t be wrong. If you need kitchenware that can take a beating and keep on heating, Glacier Stainless is for you. Each piece is made of high-grade 18/8 stainless steel and built to last for years to come. Dimensions (packed) 6.3" x 5.9" x 3.5"